A water pic also failed to make the water stick to the belt. For months I have been trying to rig up a system that will work better. I bought a set of coolant flex hoses, the smallest nozzles of which are way too large so I shrank them, and used a tile saw pump to recirculate the water. I learned those flex nozzles will not hold more than a couple psi, and a tile pump will clog very quickly. Before clogging it would sort of work at low speed. It gets to -40 here so a better system will be needed for pressurized water... I think I can manage that as well as set it up to have additives to the water, but the part I need help with is control of water after it has been used. Right now my best idea is to grind outside and let the water spray on the ground. Outside I can build a rocket heater to keep it survivable in winter. I think I get the gist of what you're saying, but don't really follow the bolded part. For what it's worth, I feel like the drip system I set up for my 1x30 works great. I do always start by evenly wetting the entire belt with an old paint brush dipped in water though (h/t Scott). Since my drip line feeds through the spark shield, even though the belt throws off the drops (wouldn't this still wick away heat anyway?) there seems to be a fair amount of bounce back, and then the remaining water also drips off the shield directly onto the blade or onto my gloves. The blades always seem to remain quite cool to me. I suppose there may be a difference in scale though, as I am usually doing quick regrinds or reprofiling the edge bevel, vs. applying a primary grind myself. Edited 1 time(s). Last edit at 05/15/2016 11:59AM by ShaperAndMower. More info... I am running a KMG so no guards, just pulleys and belts. I have had good luck with a pressurized misting system. I use a koolmist, but, their are other brands. The pressurized water is cooler than just dripping water. The mess is also less. My shop has a wood floor and it does not get too wet. I do wear a vinyl apron to keep myself dry. I do have an infrared thermometer, so next time I grind something I will try to remember to get some temps to make sure I haven't just been fooling myself. I don't think I am, but I'm open to the possibility. My other evidence is the lack of dust/sparks vs. the brief dry test grinding I did and the clumps of wet slag that collect inside the housing. With the top gaurd, side panel, and drip tray, it's a very clean operation. I don't know if this could help you, but I did have one other thought. I think evenly wetting the belt before I get started might be more important than I realized at first, so then I started thinking about maybe attaching a short, wide brush to the the bottom of my guard, angled back and maybe just barely making contact, so it channels even more of the water back onto the belt. my drip system drops the water along the belt, probably pretty close to the 3 degrees. I have it set up with a tile pump in a 5 gallon bucket with a lid under the grinder, and then have sections of roof gutter behind the belt, leading down to an empty 5 gallon bucket to catch most of the water so there is no recirculation. the pump pumps clean water to the belt, then as the catch bucket fills up, it gets thrown out along with the material that was ground. there are no sponges or brushes or anything. I use a heavy duty garbage bag, cut open, with 550 paracord run through holes reinforced with duct tape as an apron. I suppose I should make a new one, but this one has lasted a couple years. I do have a concrete shop floor, and on long grinding sessions, the floor does get wet, but the air is so dry here, that 30 minutes after I shut the grinder down, the floor is dry. you could put a rubber mat or something down to protect your floor from the majority of the water. occasionally, I have to knock the built up gunk from the gutter. during the winter, when its pretty cold in the shop even with a space heater, I try to plan grinding days for the warmer ones, or fill my water supply bucket with hot water. try painting your belt with mineral oil before grinding. i have tried it low speed and the oil stayed on the belt. i am also going to try a mineral oil and wax combination. When I was running wet on a 2x72, it seemed to help if the drip was right over the tensioner, so it had more time to settle into the abrasive before running over the top wheel. Also, I used a chunk of tile sponge to wet the belt, it would only rest with an ounce or two of force, so wore well. The belt would draw water off of it rather than the sponge drip onto the belt. Also, I run a light directly over the top of the belt, I added a paper shield to keep some of the water off of me... Will try to find a pic. Edited 2 time(s). Last edit at 07/17/2016 10:03PM by Any Cal..
Oh, just a couple thoughts. The board didn't pick up a lot of water, just contained the mess. I bet a 5 gallon bucket with a 5' stick of gutter screwed vertically inside it might do a better job than the board. It could be tucked up right behind the belt, and all the water would go into the bucket. 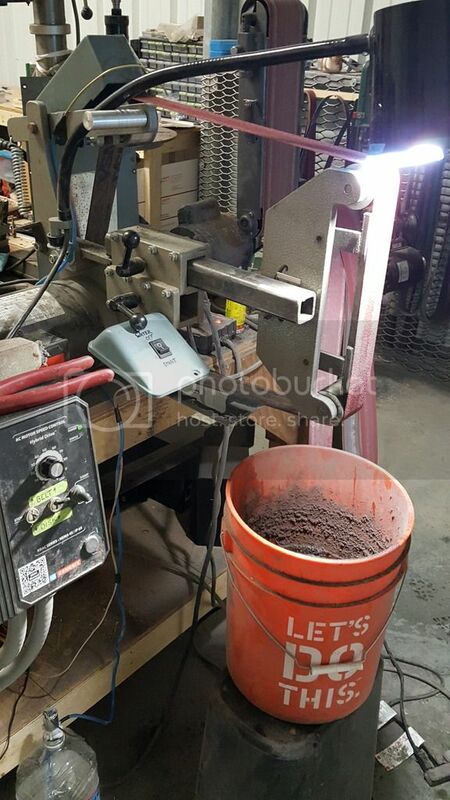 Oh, maybe a 2 bucket setup, with one under the grinder like in the pic, and a tube outlet 1/2 way up. Put your pump in the bottom one. The slag would tend to stay in the upper bucket. I just don't want to take water shields off to change belts. I didn't try to cover the whole belt with water, mostly the center 50%. The wet blade tended to wet a good portion of the rest of the belt. I don't think it stayed on well much over 2500- 3K fpm, but usually that was when you were doing profile work, not finishing up bevels. 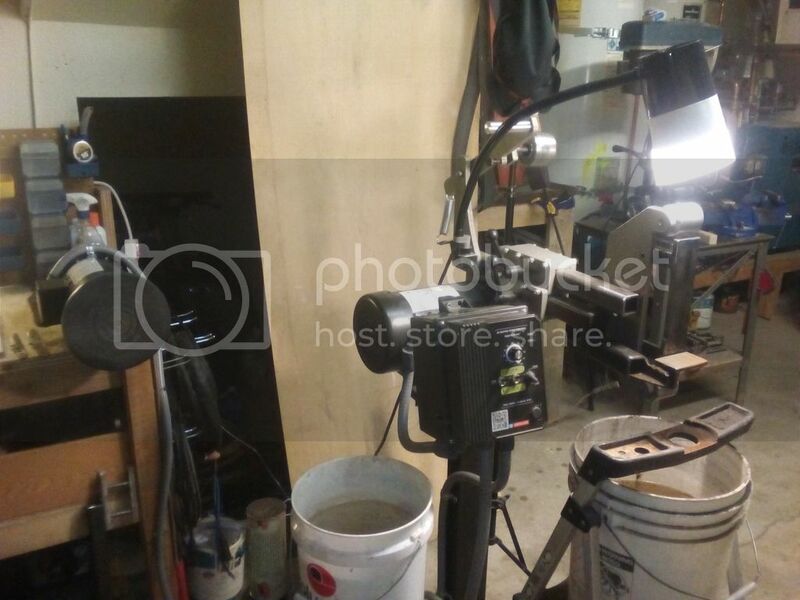 I am in a different shop now, and my grinders are on a 4x8 wooden table. I am going to see if I can get a simple wet set-up there that won't make a mess of the table. someone else just asked me to re-show how I setup my wet system. reminded me I was going to post something here. this has been very effective for me. will work as good as the output spout you configure. I had to even up an order, so got a tiny electric pump and tubing. Hoping to hook it up so it turns on and off with the belt, rather than being one extra step. Can also vary flow/pressure with voltage, though not sure if that will be worth the hassle. Maybe just a little potentiometer inside the enclosure for adjustment outside of mechanical means. Finally got around to hooking up my wet system. Not as fancy as originally intended, but turns off with switch mounted on grinder. Also, the VFD does something funny, so turns off with the grinder... No puddles on the floor because I forgot to switch it off. Also set up splash shields to keep myself and the surrounding area dry. So far so good. I get a light misting, but that is at high belt speed. Didn't leave me soaked after 1/2 hr. Thanks for the ideas guys, I still can't make the water stick to a coarse belt at speed. It just bounces off. Even the garden hose will not force a fine spray into the belt, though it's great for flooding. I have noticed that spraying the blade does remove the need to dip blades in water... that's good because my shop is not large enough for a sword dip trough. So production speed can increase and and quality is probably better... though right now there is zero because I just can't face the mess. THere's also the issue of visibility... can you see through the mist? Also having your hands soaked for hours? I feel like I'm the only one with these issues! You could try fine latex gloves. Definately gets soggy after a while on the grinder. How fast are you running your belt? when i am grinding wet, my belt speed is 200 to 300 fpm. I also use a paint brush and wet the belt before grinding. some Deefos polyester belts stretch after a while and get too loose to drive. I grind at 14.5m/s belt speed so 45-50 fps..
how the grinding will proceed faster, during stock removal I am "sectioning"
to see if grind is not "wavy" so nice and flat..
Takes time, costs more money on belts, but You get the best blades..
on low vibrations and precision of mechanic parts.. I usually grind at over 3000 fpm after roughing in at 5000 plus (6" drive pulley at 3450 rpm). Drips and streams of water just bounce off, but grinding slower takes precious time and usually I make large blades. The key was researching nozzle design. Turns out there is quite a bit to it. It's possible to get a nice mist from a hole in a hose but usually it will drip terribly even with 50 psi. A designed nozzle will provide a specific flow rate at a given pressure with specific droplet size. I got some! Now I can go back to using the plant sprayer I bought for this 11 years ago.